On a cold day towards the end of February I went on a snowdrop walk and workshop with my friend Beryl at Knot (where I regularly go for classes/workshops). The town where she has her studio (and where I went to college) has the remains of a priory (dissolved in 1540 and partially demolished sometime between then and 1709). The east gable was kept as a feature and it's very striking and instantly recognisable to people who know the area. 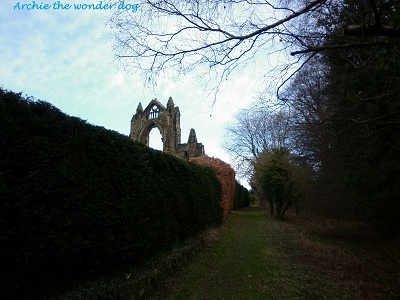 The grounds of the priory are owned by English Heritage so we weren't allowed to go past/through this hedge on the left - this was the best photo of the priory I could get but there are lots more here and there's a tour of it here if you're interested in seeing more. 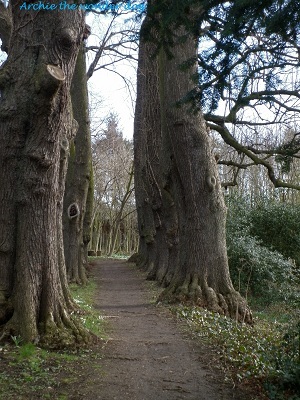 Our walk centred on the Monks' Walk which is in the photo at the end of my last post and which was established by 1773. It's hard to tell in the photos but there are thousands of snowdrops in the centre of the diamond formed by the avenue and it was a beautiful sight. After wandering round for quite a while (I could have stayed longer but it was freezing!) 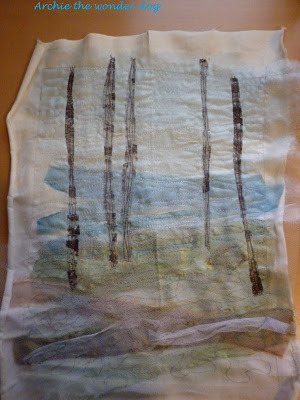 we walked back across the car park to the Knot studio and (after a warming cup of tea) set to work sketching out ideas and playing with fabric. I'm not much of an artist I can't draw a straight line with a ruler so I don't have any drawings to show, just a series of photos of my work in progress. I'm afraid I didn't take any progress photos during the workshop (I was too busy having fun!) so the first one is after about four hours work. 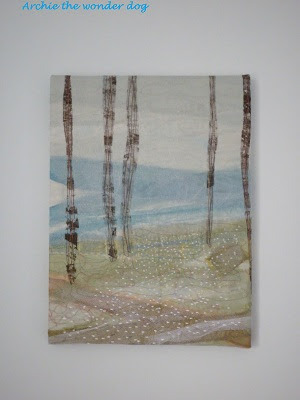 We used a combination of paint, Bondaweb, fabrics and stitching to create the pictures on a calico base. 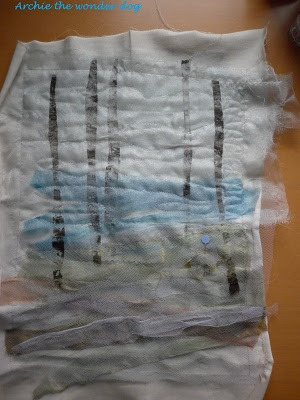 It's hard to tell from the photos but I also burnt back some of the organza using a heat gun and tore parts of the net to create more texture. At the end of the workshop. 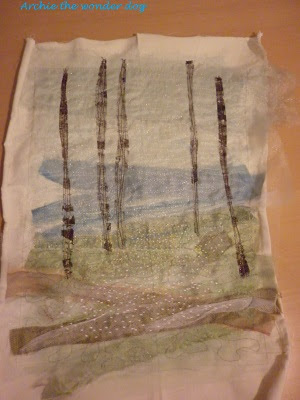 Close up of the trees and background stitching. Close up of the snowdrops. I was aiming to create a sense of a drift of snowdrops that the eye could follow through the trees and wanted to give a sense of scale and make the trees very tall (hence no tree tops. I also wanted them to appear slightly ghost-like, partly as a reference to the past and partly because I wanted a very delicate look to the picture. (Get me, I'm at risk of sounding like I know what I'm talking about!) I stretched the picture over a canvas block (using the staple gun brought back many memories of hours stood on a chair creating classroom displays!) and it'd now hanging in my parents' front room. My mam has a 'thing' about snowdrops and she gave strict instructions about what she wanted (snowdrops on a canvas block where the picture went round the sides of the block!). In fact she said that if the picture didn't have snowdrops on it she'd be sending me back for another go!! I had a lot of fun making it and will definitely be making some other 'arty' fabric pictures in the future...once I've made some more quilts! I know this post already has lots of photos but I wanted to share some of Archie and Alfie that I took a few days ago. What's that? You want what? 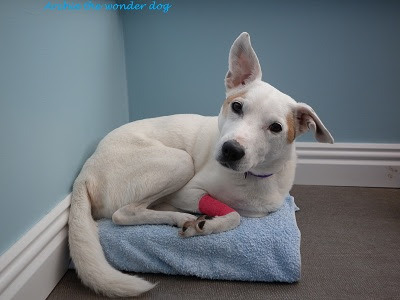 Oh, you want a photo of my bandage, well why didn't you say so?!! There's no way you're getting this bed, it's mine! 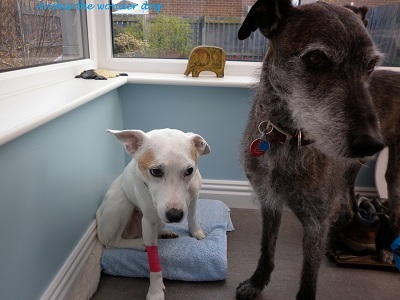 Archie has had another blood test which is why he's got a lovely red bandage on his leg...and a bald patch! Please stop pointing out my bald patch - it's not nice to laugh at the afflicted! I've heard about male pattern baldness but this isn't what I was expecting! The vet phoned with his test results and there's good and bad news...the good news is that his kidneys (which can be affected by the anti-inflammatory medication he's on) are fine. The bad news is that one of his liver levels is too high and he has to start taking tablets to support his liver function. 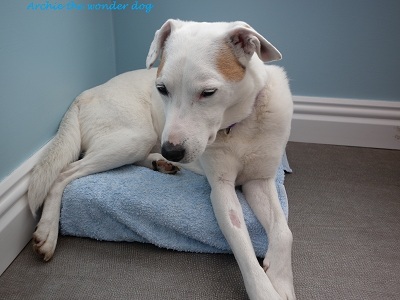 (He's showing no symptoms at the moment so if it hadn't been for the blood test I wouldn't have known there was anything wrong - maybe that nasty husky did us a favour after all!) The even worse news is that I went to pick up the tablets today and got a huge shock. The vet hadn't mentioned how much they would be (and I was too shocked by the news to ask) but they're £53 for 30 tablets and he takes one a day. £53 a month! When she told me I felt sick...there's no way I can afford that every month so I'm hoping that next month the vet will say he can drop down to a tablet every other day. Or suggest a cheaper alternative if he needs a daily dose. Fingers crossed he doesn't need to take them every day for a long time but I suspect he might...I might have start making him earn his keep - any ideas?!! He's very good at sleeping and eating so maybe he could be a bed tester or a biscuit sampler?! Do they pay well? I haven't taken the group hexy photo yet so I'm afraid you (and I!) will have to wait a bit longer to see them altogether but I'll hopefully get it done sometime next week - I can't wait to see how they all look! Must go, it's my niece's Christening tomorrow and I'm being picked up before 9am so I need an early night!! Hope you're having a lovely weekend! OH poor archie - and what a bill for medication! yes it is hard to decide how much you can really afford for a loveable pet isn't it. hope Archie gets to feeling better. So sorry about Archie, I know I couldn't afford that long term either. 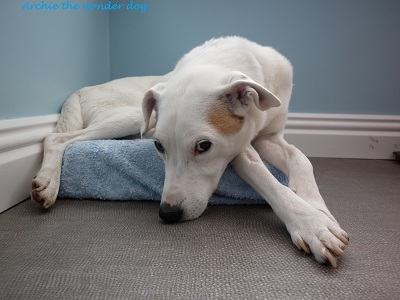 Fingers crossed he will be sorted soon- any alternative anti inflammatories, to not upset the liver? Oh heck! That is bloody expensive! I hope Archie doesn't need these pills for long. The snowbell canvas you made for your mother is so beautiful. You have a great artistic eye. Well that is a beautiful picture you made - you better start selling them, else Archie-boy will have to start making himself useful. My mum had a cat that used to steal other people's roast dinner joints; PYO Archie or no lunch! Your photos of your walk are amazing and so is the canvas you've made! Aw poor Archie, and groan for your wallet - ouch! I hope his liver function rights itself quickly, for both your sakes! Your snowdrops piece speaks to me!! It is truly wonderfully beautiful. Bless Archie's heart. I hope he is better soon. I love your picture, and the photos from your walk. 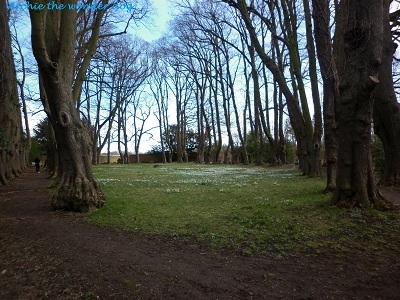 I love snowdrops and that looks like an amazing place, the flowers, the trees, all of it. I am sorry to hear about Archie, hopefully he will need less or no meds in the future or there is a cheaper alternative available. Lovely Arty Farty Quilt Helen...you are allowed to be proud of yourself! My daughter gets her meds for Charlie (a Yorky) online....waaaaaayyyyy cheaper than the vet. 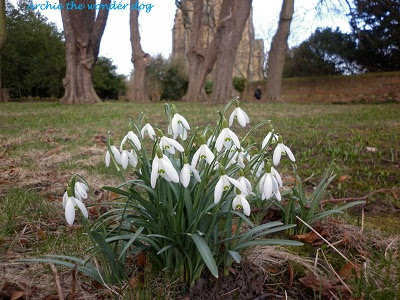 Your snowdrops picture is gorgeous, very arty farty ! Sorry to hear about Archie hopefully it won't be for long, and you get better news from the dog doctor. 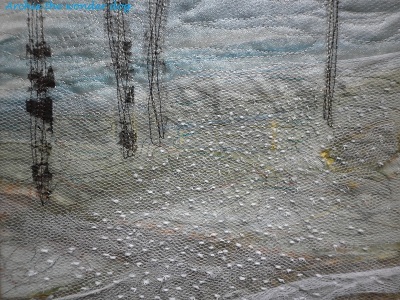 love the arty picture - captures your ghostly forest beautifully. sorry to hear about poor archie - that's very expensive medecine and hope it's not required for very long. I love snowdrops and you so nailed them in your arty farty piece - it's great fun playing with Bondaweb and paint isn't it. Sorry to hear about Archie - that is a hefty addition to a monthly budget and I hope he is ok at taking them, it was a nightmare trying to get pills down a cat!! Love the canvas! And the place where you had your walk. Poor Archie, no wonder he is putting on a sorry face. It surprised me that vet meds are as expensive in the uk as here. A good idea to check for an alternative or try online. Hope his liver can cope on its own soon. I love your artwork, very beautiful. Poor Archie, no wonder he wants to find nice places to sleep. 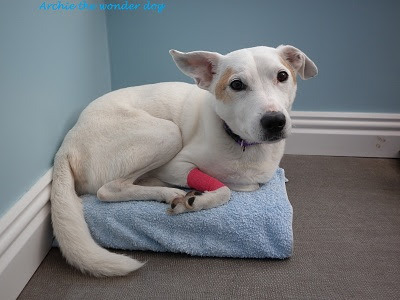 Do you have a PDSA near you, they might be able to help? 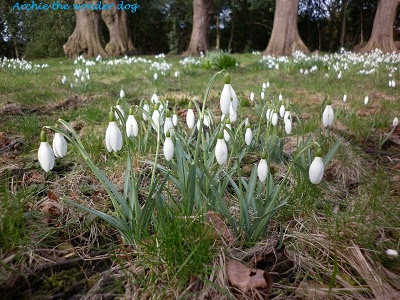 What a great interpretation of your snowdrop walk. It's gorgeous. 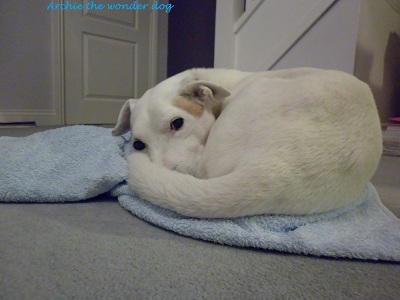 Hope Archie gets better soon or the tablets get less expensive! Great photos of the walk. I didn't get to see any snowdrops this year, so this was a treat. Love the canvas art. Ouch, that's expensive medicine. If he has to stay on it, I'd suggest looking at the places online that sell animal prescription drugs. i haven't looked in a few years so I can't direct you to any specific sites. They generally sell at a decent discount and you just need to send em the prescription from the vet. Hopefully you can find one that sells what you need to give him. Oh, gosh, that little piece of art is amazing!!! I love it - it totally does lead your eye through the trees. Clever you! Oh, Archie. Jings, that's a lot of money - here's hoping it's a temporary thing! sending LOTS of love to the little guy! 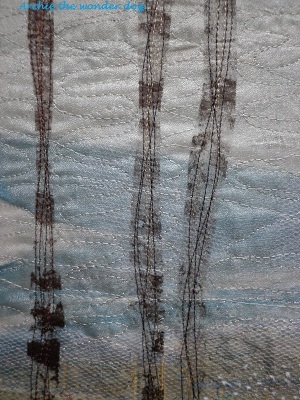 LOVE your snowdrop textile too, well done! Poor Archie - or should I say Poor you? That vet's bill is shocking. Hopefully he'll be able to reduce the amount next time. I love your quilt art!! You could definitely sell stuff like that :) Poor old Archie! I hope his need for medication is short lived and hope that you find a cheaper source or a helpful charity!